A 4-0 deficit isn’t what Denver Molly Brown had in mind when they cleated up in the Lakewood Ranch stadium this afternoon. Yet as the wind swept across the field, that’s the reality they faced. Denver’s normal break throws and insides weren’t flying like they should. Perhaps it was nerves. Perhaps it was the wide marks of Brute Squad’s Angela Zhu and Julianna Werffeli. But the game wasn’t going as planned. The full drama of Brute Squad’s victory over Molly Brown for a third year in a row is tough to capture (but we tried to here), but a brief series in the first half perfectly captured why the Denver team couldn’t prevent Boston from winning once more. Late in the first half, Molly Brown broke once, but they couldn’t turn one break into two. Denver’s defensive line has changed throughout the season as they lost stars like Hannah Leathers to injury, but with firepower like Jesse Shofner, Manuela Cardenas, and Lisa Pitcaithley on their kill line, they’ve been able to generate plays and churn to convert. 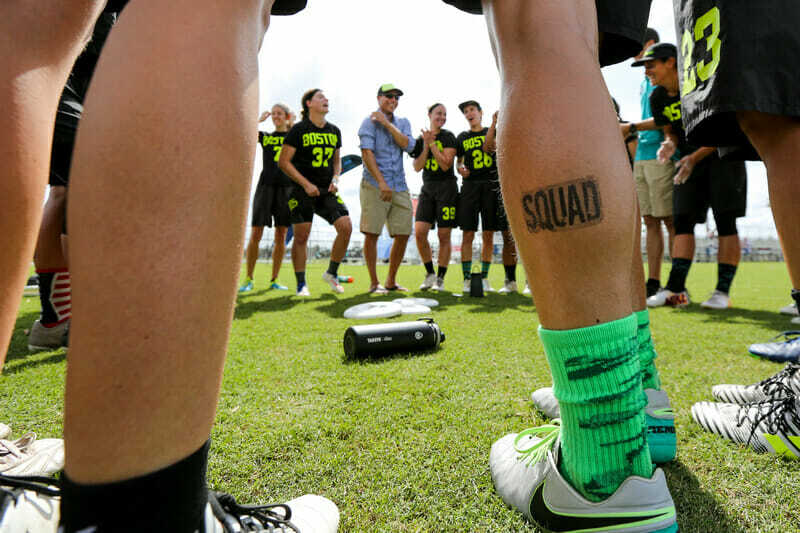 Brute Squad – their perennial semifinal rival – would be a much bigger challenge. Denver would break again after Brute Squad’s hold, but they couldn’t build momentum against Brute Squad’s various offensive lines. The pattern would hold for the rest of the game: Molly Brown would break twice more in the second half, but even when they beat one Brute Squad line, the other would trot out on the field. Brute Squad’s depth allowed them to run three separate lines throughout the game, so Denver never faced the same matchups two points in a row. Typically, Brute Squad deployed Callahan winner Angela Zhu, Caitlyn Lee, Kami Groom, Lauren Sadler, Cassie Wong, and Caitlin O’Connell when they were headed downwind. Going upwind, Claudia Tajima, Liên Hoffmann, Becky Malinowski, Becca Ludford, Tulsa Douglas, Emily Baecher, and Elana Schwam executed with tight windows and high pressure. Molly Brown also set an upwind and downwind line, and while their upwind line could generate turns and grind into the high endzone, their downwind line couldn’t contain Tajima’s firepower or Hoffmann’s speed – even when they set Manuela Cardenas on her. “We kind of relied on a certain line to get us going upwind, then we needed that same firepower to get us down,” said Chastain. Molly Brown got blocks out of Brute Squad – and often Brute Squad gave them the disc – but they struggled in the wind, and their strongest receivers weren’t winning enough 50/50 shots. There were myriad factors contributing to Brute Squad’s win as well as Molly Brown’s loss. Yet Brute Squad’s ability to execute with completely different lines hampered Denver’s attempts to stymie their flow, and it made Brute Squad a mentally tougher team. They’ll try to throw each of these lines at Fury tomorrow during the Championship final. Comments on "Brute Squad’s Depth Defies Denver’s Defense"